Darlene Emmons, a history teacher in the Harmony Grove School system, approached Mayor Jeff Arey about documenting the history of Haskell. Jeff gave her the names of several people in the City he thought would be interested in helping her. This she did and as they say, the rest is part of our history. During the summer of 2009, the Haskell Historical Society held its first meeting. Later in the year, a discussion was held with Mayor Arey and it was learned the City had purchased a lot next to the Community Center. The property, along with a house, belonged to Treba Catton. The City wanted the property to complete the City Park area. Jeff suggested we approach the City Council and request the house be loaned to us for a museum. The Council approved the request and renovations were started. With the financial assistance from the City, donations from the community, and money from the Historical Society, the remodel was completed and the museum held its grand opening in November, 2010. As soon as word spread of the museum, we had a tremendous response and people started contacting us about loaning or giving items to the museum directly relating to people, places or events that had a connection to Haskell and its early beginnings. You may give or loan us an item, book, document or picture by contacting us during museum hours or calling one of the Historical Society Officers. At the present time, we have over 300 items on display along with documents, books and pictures giving us an insight to our past. 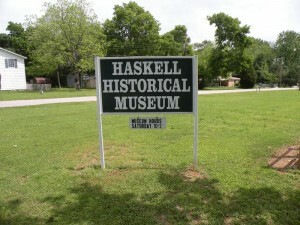 The Haskell City Museum is located at 529 East Elm (next to the Community Center and ball fields). Our volunteers open the museum on the Second and Fourth Saturdays from 10:00 AM until 2:00 PM, during the Summer (Easter – Thanksgiving) and the Second Saturday from 10:00 a.m. until 2:00 PM, during the Winter (Thanksgiving – Easter). To schedule an appointment for a tour anytime call President Emaline Stroud 501.303.0384 or Vice President, Darlene Emmons 501.317.2913 The museum meets its expenses through membership dues ($20.00 for a family or $15.00 for a single membership per year), donations, and other consideration from the City. We encourage anyone interested in the history of Haskell to come to the Haskell Historical Society meetings and take part in any of our discussions or give us your memories of Haskell. Meetings are held every third Tuesday of each month, 3:30 PM, City Hall conference room.